RIO DE JANEIRO, BRAZIL – Petrobrás, Brazil’s state-controlled oil company, is suspected of inadvertently funding a political campaign of the ruling Worker’s Party (PT) through a contract with local NGO, Pangea, current affairs magazine Epoca reported last week. Bahia governor Jaques Wagner and former Petrobras president José Sérgio Gabrielli, photo by Manu Dias AGECOM/Flickr Creative Commons License. Pangea is an environmental conservation and sustainable development NGO which receives a large amount of state funding for its operations in Bahia state. A report by the Controladoria Geral da União (Brazil’s Office of the Federal Controller General) indicated that of the R$7.7 million Pangea received from the state, R$2.2 million was unaccounted for. This money is suspected of having been diverted to a slush fund of a PT campaign in Bahia state, the home state of ex-president of Petrobrás, José Sérgio Gabrielli. Despite this strong rebuttal, the incident raises fresh concerns over the financial interaction between the government and Petrobrás. The lack of transparency and clear auditing on transactions and the subsequent use of funds has led to accusations that the government is using Petrobrás money for political party advancement. “It is quite common in Brazil for state enterprises to get ‘involved’ with local and state politics, including ‘contributions’ to campaigns”, David Fleischer, political analyst at the University of Brasilia, told the Rio Times. “This usually does not involve ‘direct contributions’ to parties or candidates, but rather cultural support funding for NGOs that are in the end linked to certain parties and/or candidates – as in the case of Petrobras and Pangea in Bahia”, he added. President Rousseff participates in the inauguration of the president of Petrobras, Maria Silva of Grace Foster, photo by Roberto Stuckert Filho/Presidência da Republica. Government interference has a potential to rattle investors who fear that company profits will be swallowed up by the political machine rather than being used to pay dividends and invest in research and development. Pemex, the Mexican state-run oil company, is an example of stunting a companies development, resulting in an inefficient state monopoly that lags well behind foreign competitors. After decades of short-term management, Pemex’s slide now seems irreversible. Petrobrás does not appear to be slowing though, and the outlook for 2012 includes increasing to 66 offshore wells compared with 47 in 2011. The company also expects to add fifteen drilling rigs in 2012, bringing the total to 34 drilling rigs operating offshore in Brazil. In July 2011 Petrobras announced an investment plan of US$224.7 billion for the period between 2011-2015. The company thinks it can nearly triple its production, from around 2 million barrels per day to 6 million by 2020, becoming the third largest oil producer in the world. 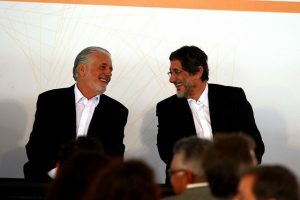 The claims surrounding Pangea come just weeks after the departure of Gabrielli, Petrobras president for the past seven years, who left the post to offer political support to the PT governor of Bahia state, Jaques Wagner. Gabrielli is considered by some analyst to be paving the way for his candidacy in the 2014 elections. 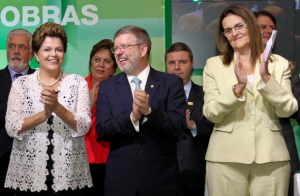 The new Petrobrás president, Maria das Graças Foster, also has close ties with the government and is a close friend of President Dilma Rousseff.